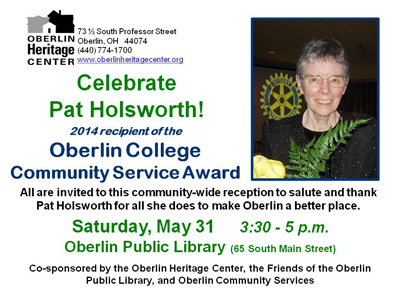 Greet and meet Oberlin College's recipient of the 2014 award for Distinguished Service to the Community, Patricia Holsworth, on Saturday, May 31 from 3:30 - 5 p.m., at a reception held at the Oberlin Public Library (65 South Main Street). The free event is hosted by the Oberlin Heritage Center, the Friends of the Oberlin Public Library, and Oberlin Community Services. This informal gathering is open to the public, offering light refreshment and the opportunity to applaud and appreciate an exceptional volunteer and mentor to many in the Oberlin community.